I had just changed my SSD, after installing Windows Home I discover that my sound/audio is not working. I did a sound test and I could hear sounds and pass the test. However when I play YouTube it had sound like for few secs and then it went mute again. 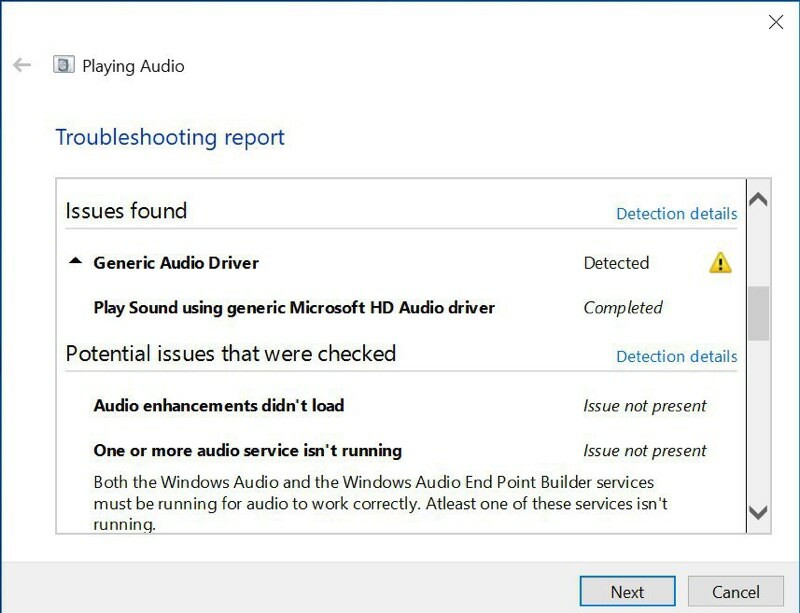 Kept having the “Generic Audio Driver Detected” error. Please help appreciate it.im not sure what to do already. 1. I remove and reinstall the Conexant Audio driver under Device Manager from ASUS website. I updated the driver as well. 2. Reformat my pc once again, check all sound area if muted etc. 3. Search online for troubleshooting guides and follow all of them. Disable and enable the sound audio settings etc. 4. Right click to troubleshoot on the sound icon. Went to sound settings to disable all enhancements etc. 6. I went online ASUS live chat but the agent can’t help to resolve. Previously I had sent in for diagnostic only my SSD is faulty. TS, seem that one problem solved another pop-up.. I prefer to use external speaker especially better & able to control the volume better. 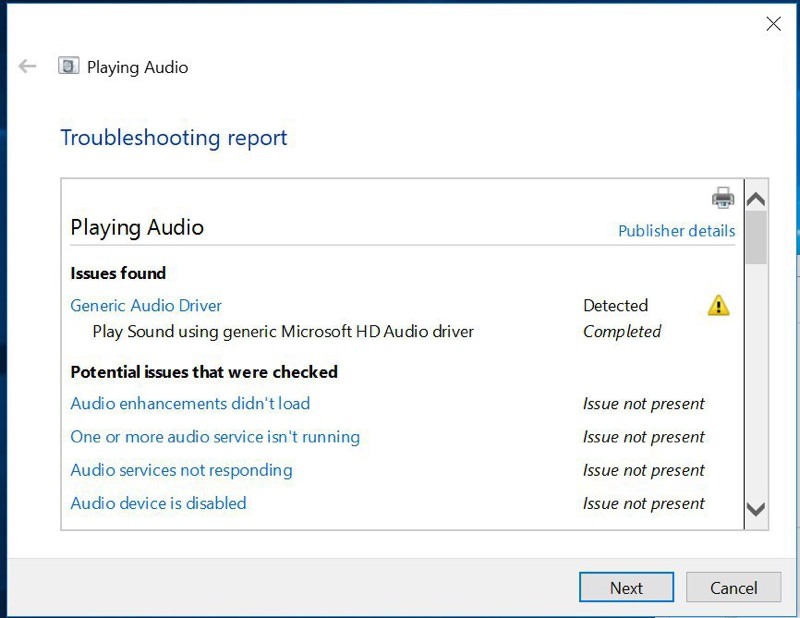 May not be the correct section to seek on audio matter.. since Windows updates unable to get the correct driver. Seek Mod to move to the correct section. Yes. I am starting a thread here as I am unsure if this is a windows 10 issue or updating of the BIOS would help? Mod please move to the correct section apologies. Not many members read this section hence no response. Hardware Clinic section more experts in various hardware. As this is due to sound card or audio hardware matter. Anyway i had reported to Mod to move to the correct section..
Lucky my Toshiba 3 laptops have no issue in hardware on Windows 10. It auto update the correct drivers during installing Windows 10. Try booting with a linux thrumvdrive to further confirm if it's a software or hardware issues. From Device Manager, click on "Sound, video and game controllers", double-click on the audio device. Look under "General" and "Events" tabs for the error messages. "Driver" tab to update the driver for the device to the Asus driver rather than the MS generic driver. Last edited by Koenig168; 08-08-2018 at 08:23 PM..
Yup. Thanks I did that too. I download the asus driver and manually reinstall or upgrade it both don’t work. It seems that Conexant Driver not compatible with Windows 10 1803. Generic Window drivers will work but sound will break when OS auto update to conexant driver. Solution Driver at end of first post? Last edited by Blindaim; 08-08-2018 at 10:39 PM.. The least painful solution will be to go for an external DAC. It is worth considering anyway as the sound will be better than your onboard audio. The sound troubleshooting report shows issue not present for all. I tested the sounds in the troubleshooting mode and it was working. When I play YouTube it had sounds for a few secs before it stopped having the sound. Yes i think I get what you meant. I tested with Realtek audio and this conexant driver it break when it could play for a while. I uninstall and it auto updated conexant driver back. Updates: I followed your link and updated one of the 3 driver links in the first post it worked initially but then the sound broke again will try again. Last edited by Matrock5; 08-08-2018 at 11:53 PM..